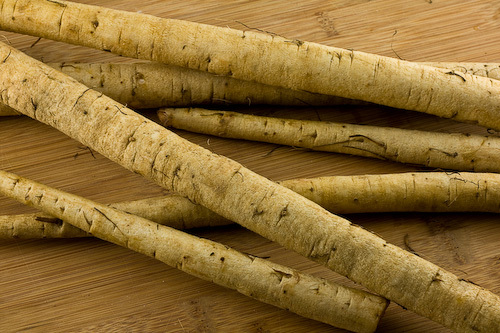 Burdock Root is a real health food commonly referred to as “Gobou” (what I’ve put in my endometriosis diet). You can buy these at local Chinese, Korean, Thai, or other Asian supermarkets. If you’re lucky then your local organics grocer may have it too. The fresh forms are usually in the Asian markets because the American Food Markets have usually only the vitamin supplement for burdock root. Whichever you take (I enjoy the fresh version the best), having some is better than not having any! contains dietary fiber, calcium, potassium, amino acids, and is also low in calories; burdock root harvested in the first or early in the second year contains vitamins B complex and E; trace minerals which are present include potassium, phosphorous, chromium, cobalt, iron, magnesium, silicon, zinc, thiamine and sodium. How to cook it fresh? It looks weird and like a tree trunk?? Here’s how I prepare my stir fry dish. Although you can go all vegetarian, I found a little lean meat to bring lots of flavor. Then take a peeler and deskin the burdock root. Then cut the burdock root into this strips (like the picture). They should be about 1.5-2 inches in length and less than 1/4 in in thickness if you can! This could be the hardest task. As you’re cutting them, put the finished cut pieces into a cold water bath with 1 Tbsp of vinegar. This will keep their white color! Now you’re done with the main ingredients. Recipe with meat: Heat your wok or pan with your healthy oil. Put in your garlic and hear it sizzle for about 10 seconds and then put in your meat you just marinaded. After your meat is fully cooked, remove the meat to a dish and leave the juice in the pan. 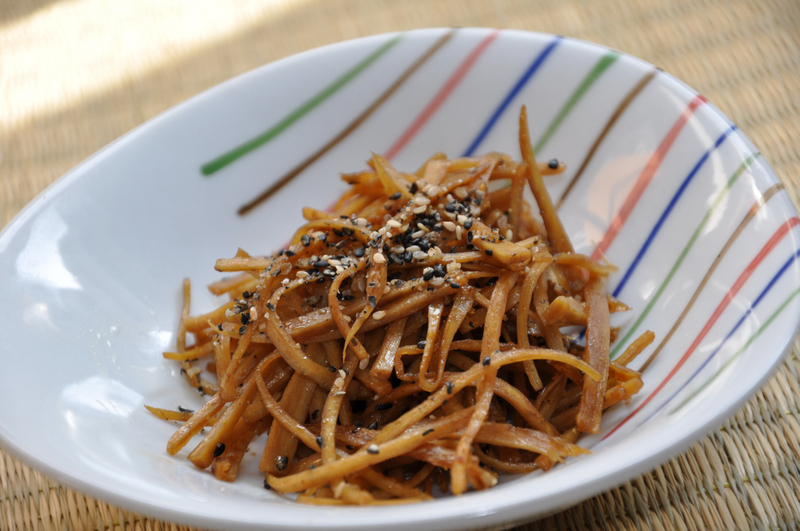 Put in your burdock root and stir fry until the color of the burdock changes. Take a bite and if it’s crisp and cooked, dump the meat back into the pan. Mix for about another minute. Then dump in the rest of the vinegar. Taste. If not salty enough, sprinkle some salt. It should taste slightly salty, vinegary, and sweet. If the taste is to your liking, then sprinkle the sesame seeds on and voila! You’re done! Vegetarian recipe: Heat your wok or pan with your healthy oil. put in garlic and hear it sizzle for about 10 seconds and then put in the burdock. Sprinkle in your soy sauce, sugar, pepper, rice wine and sesame oil. Cook until the burdock root changes a bit in color and taste for the doneness of your liking. When you feel it’s done, put in the vinegar and saute for a minute more. Taste. If not salty enough, sprinkle some salt. It should taste slightly salty, vinegary, and sweet. If the taste is to your liking, then sprinkle the sesame seeds on and voila! You’re done! This type of cooking preserves the burdock root in it’s natural form and is most healthy. Enjoy! I eat this on a weekly basis for my endometriosis diet. It’s great for other infertility symptoms too including hypothyroidism, pcos, ovarian cysts, cancer, etc. This entry was posted in General, Health Foods, Infertility and tagged Diet, diet plans, Endometrioma, Endometriosis, health foods, homeopathic diet, hormone balance, hormone balancing, Hypothyroidism, Infertility, weight loss. Bookmark the permalink. Hi everybody, here every person is sharing such experience, thus it’s pleasant to read this blog, and I used to go to see this webpage daily.